PoPville » Supra, DC’s “first Georgian restaurant” opens Tuesday! “Co-owners Jonathan and Laura Nelms announce the November 7 opening of D.C.’s first Georgian restaurant, Supra, at 1205 11th Street, NW. Chef Malkhaz Maisashvili, who brings over 25 years of experience as a chef in some of Georgia’s most acclaimed restaurants and at the Embassy of Georgia here in Washington, will serve his take on the country’s most beloved regional dishes. Supra’s menu celebrates the full range of Georgian food – from heritage and rustic recipes to more refined dishes – with a modern interpretation by Chef Maisashvili. The menu is reflective of the culinary influences, from the Mediterranean and the Silk Road, that shape Georgian cuisine. Indigenous Georgian ingredients like walnuts and pomegranate permeate all sections of the menu from food to cocktails, alongside fresh herbs and unusual spices such as dried marigold petals and blue fenugreek, creating a flavor palate that is bold yet accessible. Small plates include vegetable paté-like pkhali made of spinach, green beans, or beets minced with walnuts and Georgian spices; gebjalia, a fresh cheese with mint served with tomato; house-made kupati sausages with pomegranate and fried pickles; grilled quail makvalshi with a savory blackberry sauce; and a variety of khinkali soup dumplings. Traditional Georgian breads, including several types of the iconic stuffed breads called khachapuri, will come out of the kitchen, which features a traditional toné oven. 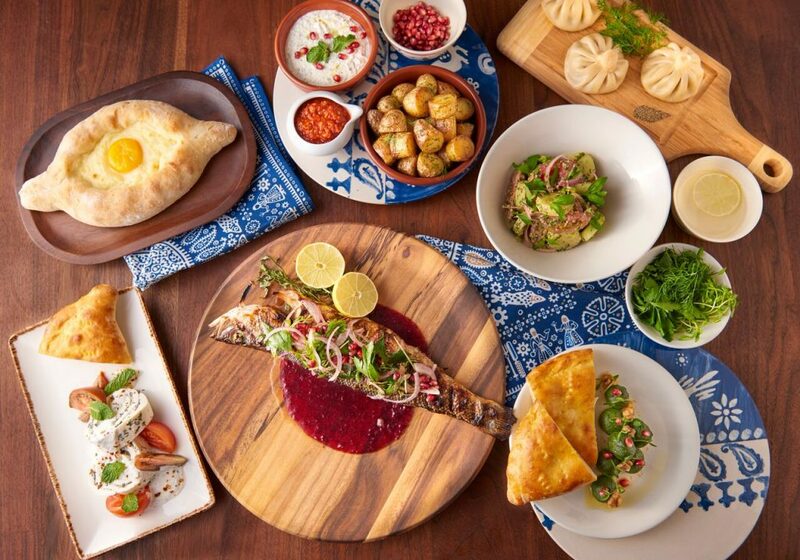 Guests can also expect larger communal dishes such as whole grilled branzino with pomegranate sauce; chanakhi lamb with seasonal vegetables; and the rich, garlicky chicken dish, chkmeruli. After visiting many Georgian wineries, Jonathan and Laura look forward to introducing guests to wines from a culture believed to be the world’s oldest, dating back some 8,000 years. Supra will be offering some of the country’s most sophisticated and unique wines from renowned labels such as Orgo and Pheasant’s Tears as well as smaller, family-owned operations like Naotari. Cocktails are inspired by the liqueurs and flavors of the region. The “Chacha Sour” features Georgian brandy, lemon juice, egg whites, and Angostura bitters. The seasonal “Grow a Pear” incorporates Georgian sparkling Bagrationi wine with fresh pear, pear liqueur, and Angostura bitters. The 136-seat space, designed by 2Scale Interiors, will follow suit with nods to traditional Georgian culture (wooly Georgian “papakhi” hats and “supra” tablecloths) alongside displays of modern art from Tbilisi (White Studio), Moscow (Petrovka Art Studio), and D.C. (Schwa Design). Georgian street artist Gagosh will be traveling to Washington in the coming months to create a mural on the brick wall of the bar. Jonathan has long been fascinated with Georgia, beginning with a teenage friendship with a Georgian exchange student, who inspired him to embark on his own exchange year in the then-Soviet Union through the American Field Service. It was during this time that he had his first exposure to Georgian food and wine, a cultural passion that he channeled into a legal career focused on high-risk business transactions in Russia, Georgia, Central Asia, and the rest of the former Soviet Union. A fluent Russian speaker, he frequently travels to the region and lived, together with his wife Laura and their daughters, for three years in Moscow, where they observed the overwhelming popularity of Georgian restaurants among expats and locals alike.